“I think a lot of it is still hard to grasp of how is it just one bullet, you know? And how does it go through one person and then the other person and kill the second person? It’s just not fair,” Hartman said. Yes, that is all it takes. One bullet and instant death. Accident, suicide, unintentional, homicide, terror attack….. Just one bullet. Guns and alcohol don’t go together. Before 5 p.m. Monday, the children played in the road near Merritt’s house. One was an 8-year-old boy, the other a 1-year-old girl, said Mark Peper, an attorney for the children and their parents. Merritt emerged from his home and told them to be quiet. The grandparents, who were watching the children after school, learned about the encounter. They told Merritt not to yell at their grandchildren. “Merritt got upset and … retrieved a .22-caliber pistol,” the sheriff’s statement said. He confronted the grandparents and the children’s mother, telling the woman that she and the baby she was holding were going to die. He started shooting at several people there and followed them a short distance as they scattered. The grandfather was hit in the left chest, an arm and an ear. He had tried to shield his family from the gunfire, Peper said. A bullet struck his wife in the chest. You can’t make this stuff up. Children playing? That deserves a bullet? Anger and guns don’t go together. The thing is, when the gun lobby wants to arm anyone and everyone and allow people with no permit, no training and absolutely no common sense to have guns loaded with deadly bullets around everywhere, this is the result. This incident occurred at a child care provider that is also the residence of a Stafford County Sheriff’s Office recruit, according to officials. The recruit was not at home at the time of the incident. Aren’t children supposed to be safe at child care centers? A woman I know said she was asked if there were guns in the home before she was licensed as a home daycare provider. The cavalier attitude towards guns that is shown by some gun owners is a national public health and safety problem. Children and guns don’t go together. The owner of the bullets used to shoot others are the ones who have to be responsible and careful because bullets are deadly and don’t know where to stop. Often enough, however, bullets are very intentionally aimed at an innocent person resulting in instant tragedy. The “good guy” with the gun who shot at grandparents and children because of noisy playing is a poster boy for all that is wrong with the American gun culture. He represents what the corporate gun lobby wants. 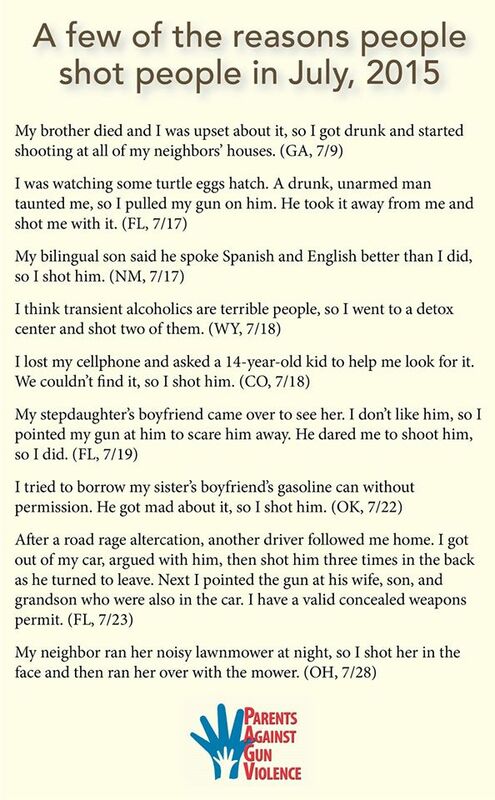 The “good guy” with a gun who shot my sister became an instant “bad guy” with a gun. Domestic disputes and guns don’t go together. What should we do about this state of affairs? We should educate people about the risks of loaded guns to their owners and those around them. 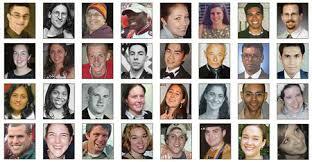 We should insist on laws that prevent those who should not have guns from getting them legally or illegally. Yes, it is legal for prohibited purchasers to buy guns legally with no background checks in case you were thinking of arguing about this fact. We should pass safe storage laws and insist that all guns are locked up, unloaded, away from small hands, teens and others who could be dangerous to themselves or others. We should strengthen our gun trafficking and straw purchase laws. We should pass mandatory lost and stolen gun laws. We should pass laws to hold parents responsible when their gun is used in an “accidental” shooting by their own child. We should pass gun violence protection order laws so that families can report a person who could be dangerous to him/herself or others to law enforcement so the guns could be removed from their hands. We should insist that all gun buyers have training before walking out of a gun store with a deadly weapon. We should make sure that if someone wants to carry a loaded gun in public, they are vetted carefully and have training in how to carry that gun. We should agree that an armed society is not a polite society nor a safe society. We should ASK if there are loaded guns in the homes where children hang out and play. In both smell and presentation, this cologne draws out the rebel in every man with striking aromas and a gleaming gun cylinder bottle. What? What do mens’ cologne and bullets have in common? Maybe manliness, or being a rebel? What does that mean? The not so subtle intimation that only a rebel with bullets and Azzaro cologne can be real men? All it takes is one bullet. All it takes are elected leaders who will stand up to the corporate gun lobby. All it takes are Americans making more noise, raise their voices against our gun violence epidemic and get involved to save lives. Like the voice of this little boy who tells it like it is. He doesn’t want a bullet to take his life. He just wants to go to school to learn his numbers. All it takes is just one bullet to change the lives of innocent people forever. This little boy knows that. Our leaders should listen to his voice and do something about it.